All of the first 5 "Buck Denver Asks 'What's in the Bible?" DVDs in one pack at great top-value price - what more is there to say? Only this: 'What's in the Bible?" is probably the best way into the Bible for children 4 to 10 (and grown-ups to at least ten times that) for a long, long time. Using all the animation, computer graphics, puppets and catchy songs that children love, this comprehensive look at what the Bible is, what it says and what it means for youngsters today, makes the Bible as lively, engaging and relevant as it was always meant to be. If you’ve never come across 'What's in the Bible?" DVDs before, play the video clip and add this bundle to your order. The first DVD introduces kids to the Bible and the book of beginnings, Genesis. Children will learn about the key people in Genesis and the important lessons their stories teach us. The second DVD introduces kids to the book of Exodus: the oppression of the Israelites and the birth and rise of God’s chosen leader, Moses. What's In The Bible Volume 3 is designed to help children gain a greater understanding of how these 3 fantastic books and how they follow on from Genesis and Exodus to make up the Pentateuch and they set the stage for the trials and victories faced by God's people. 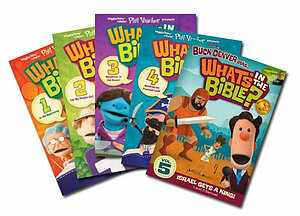 In What's in the Bible Vol 4 Buck Denver and friends take children through Joshua Judges and Ruth and explore 2 more of the Big Questions about faith. The two episodes look at three Old Testament Kings, Saul, David and Solomon. Volume 5 also explores the Trinity in its Tricky Bits feature. What's In The Bible? Value Pack is published by Eden bundles and is our 13053rd best seller. The ISBN for What's In The Bible? Value Pack is EDENBUNDLE-1085. Reviewed by Ruth, love my children's Christian stuff! I bought this to see if it was any good before suggesting it to people having seen a tiny clip from Phil Vischer on Youtube. It's brilliant! It covers some really tricky ideas (like how did we get all the books of the Bible, what is the Apocrypha, what does 'Inspired' mean) not to mention covering the story of Genesis and Exodus. My 20 month old will sit & watch it as it moves fairly fast & has quite a few songs scattered throughout. Both adults and children will learn from this. Love it! Everyone can learn from this! Reviewed by Pauline, children's club leader. I have been buying these DVDs for our children's club at church. The older children can't get enough of them, and are really disappointed if we miss a week. Some of the younger (non-church) children struggle to stay focused for the full half hour, and some of the content is a bit over the heads of the older ones too. I would have liked to have been able to spread each DVD over 2 weeks, but there is not really a suitable place to do this. As a bonus, the leaders are learning a lot! All in all, an excellent resource.I would particularly recommend it for 8 years and over, and if you are in a club situation like I am, have a revision week after 3 or 4 episodes. Got a question? No problem! Just click here to ask us about What's In The Bible? Value Pack. What DVDs are included in the What's In The Bible Value Pack? A:What's in the Bible DVDs Volumes 1, 2, 3, 4 and 5 are included in the What's In The Bible Value Pack. Get volumes 1, 2, 3, 4 & 5 of the fantastic DVD series What's In The Bible? for one great price. • Part 1: “What Is The Bible? How is it put together?” Kids learn alongside Buck Denver, Sunday School Lady, Brother Louie and the crew that the Bible tells the story of God and what he's done for us. • Part 2: “Who Wrote The Bible?” Next, Buck and friends learn how God inspired people to write the Bible. They also learn how the first part of Genesis sets the stage for the rest of the Bible - and all of history! • Part 1: “Who chose the books in the Bible?” Buck Denver and friends learn how the Old Testament and New Testament books were chosen to be in the Bible. They also dive into the second part of Genesis to learn how God used a family to launch His big rescue plan! • Part 2: “What is salvation?” Learn words like “salvation” and “redemption” as the puppets discover God’s big rescue plan – how He saved the Israelites from Egypt and how He wants to save us from sin. • Part 1: “Don’t lie, don’t cheat … don’t trim your beard?” The Old Testament is full of rules, and some of them are kind of, well, weird. Learn why God gave all these rules to Israel and which ones still apply to us today! • Part 2: “What is a Pentateuch?” Learn about Israel’s 40-year “time-out” as we finish the first five books of the Bible! Plus, discover why we can believe what the Bible says – even though we weren’t there to see it happen! • Part 1: Pirate Pete takes flight in a hot-air balloon to help Sunday School Lady explain the book of Joshua in Part 1. • Part 2: The Fabulous Bentley Brothers sing about the Book of Judges and Chester Whigget tells the story of Ruth. • Part One: “The People Want a King!” Buck and his friends look at 1 Samuel and the life of Saul as Israel’s first king. • Part Two: “Kings Make Mistakes Too!” The puppets move on through 2 Samuel and the first chapter of 1 Kings, including the reigns of King David and his son, King Solomon. In 'What's in the Bible?' 6 the cast of puppets and cartoon characters lead children through stories of good and bad kings with fast-paced animation and catchy tunes. A Nation Divided' gives you episodes painting the big picture of the Kings and Chronicles story. • Part One: "The Big Split" Israel is split in two, and the prophet Elijah faces off with 450 prophets of Baal to prove that Israel's God is the true God! • Part Two: "The End of Israel" A bunch of unfaithful kings lead to the end of Israel and Judah, but Isaiah has an amazing message in Israel's darkest hour. • Part One: "Ezra & Nehemiah" The exile is over, but the Israelites face BIG challenges back home in Judah! The Israelites return home to Judah to rebuild God's temple - a task full of unexpected challenges. • Part Two: "Brave Queen Esther" A brave young Jewish girl risks everything to save her people from doom at the hands of the evil Haman. Here comes the Wisdom Writings, Psalms, Proverbs, Job, Ecclesiastes and Songs of Solomon, in What’s In The Bible 8. This DVD tackles the book everyone usually ignore in Sunday School and deals with big questions like – what’s the difference between being smart and wise? • Part One: "Poems in the Bible?" Learn about the Bible’s poetry, the amazing story of Job, and Psalms – the Bible’s song book! • Part Two: "Wisdom from Above" Solomon shares his wisdom in the book of Proverbs, then Sunday School Lady finds the meaning in Ecclesiastes and explains how the Song of Solomon – a book of love songs – ended up in the Bible! Buck Denver and his trusty gang of puppets and cartoons will guide you and your family through the 17 major and minor prophets, including Jonah and the Whale, Daniel in the Lion’s Den and the hope-filled prophets of Isaiah. • Part One: "Prophets, Prophets Everywhere!" What's a prophet? And where do these 17 books fit in the history of Israel? • Part Two: "Messages of the Prophets" Meet the prophets that wrote these books and see what they tell us about God's big rescue plan! Christmas DVD: Buck Denver Asks... Why Do We Call It Christmas? • Why do we celebrate on Dec. 25th? • What year was Jesus really born? • What do Christmas trees have to do with Jesus? • What about Santa Claus? Where did he come from? • Which came first – Christmas or Hanukah? And which one did Jesus celebrate? • How does the name “Emmanuel” explain the real meaning of Christmas? So far the puppet super-stars have covered the entire Old Testament in 9 DVD's. Over the next few years 4 more DVD's will be released travelling through the New Testament, but as soon as we here any more news we'll be the first to let you know.